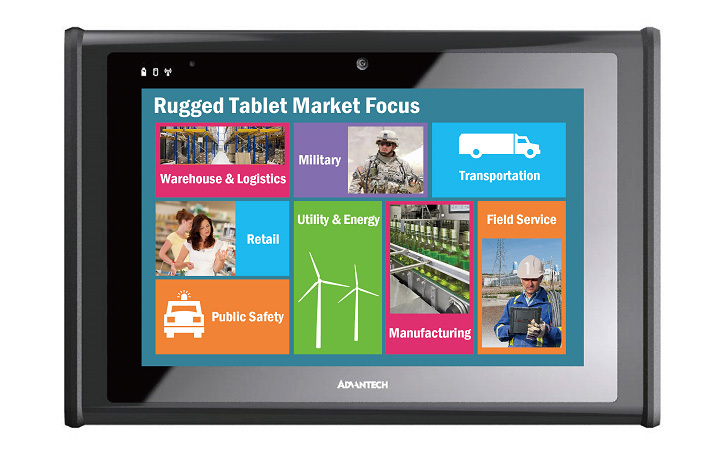 The Advantech Mobile Computing team offers industrial grade mobile computing devices including: Industrial Tablet PCs and In-Vehicle Computers for MRM (Mobile Resource Management). With expertise and experience in Design & Manufacturing Services (DMS), the Mobile computing team provides high quality and high performance solutions for design-in oriented Key Accounts. Target markets include Manufacturing, Field Service, Retail, Public Safety, Transportation, Utility & Energy, Military, and Warehouse & Logistics. Advantech Mobile Computing performs drop tests that comply with MIL-STD-810G environmental testing; random vibration tests that comply with IEC60068-2-64 environmental testing, and bump tests that meet IEC60068-2-29. 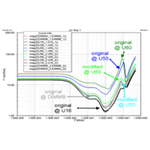 With simulation of real-world shock pulses and impact energy levels, Advantech Mobile Computing can systematically test and optimize product design and real usage cases. 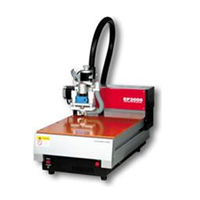 Products for industrial, in-vehicle, or outdoor applications have special demands. Advantech’s rugged design considers extreme environmental conditions – operation in high or low temperatures, thermal shock, high humidity, electromagnetic disturbances and low-temperature startups. Advantech Mobile Computing ensures products are certified water-resistant and dust-proof. We establish water and dust resistance, custom IP grade according to customer requirements. 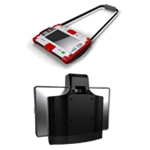 Advantech Mobile Computing has the ability to integrate a broad range of peripherals in mobile devices to fulfill different industrial applications, such as Barcode reader, NFC reader, MSR, Finger Printer, and so on. Advantech Mobile Computing challenges itself to realize super thin, lightweight designs, push the limits to transcend industry models. 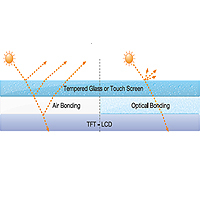 Advantech has in-house supplies of optical bounding. These solutions reduce the reflection rate to under 0.2%, with no shadowing effect and high transmittance > 98%. 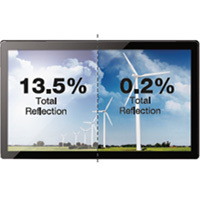 Advantech Mobile Computing ‘s high brightness display solutions improve contrast ratio and enhance color saturation, yet with low power consumption and low temperature on panel surface (CTF). 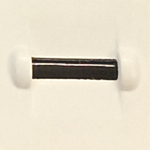 They also feature high uniformity (90%): up to 1,500 ~ 2,000 nits. 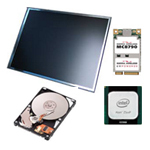 Advantech has in-house sunlight readable displays. These sunlight readable solutions reduce the reflection rate by 2%, and improve contrast ratio by 10%. Advantech mobile computing provides better color saturation in outdoor applications, without increases in power or heat. Advantech has iManager API for smart power management. 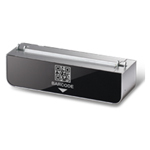 The hardware protection feature is based on thermal reduction with CPU throttling technology. 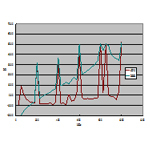 iManager ‘s “CPU Throttling” intelligently controls CPU core frequency to manage power efficiently. Advantech has design know-how in hot-swappable battery schemes and mechanisms; batteries may be changed easily without interrupting ongoing jobs, which enables non-stop operation. 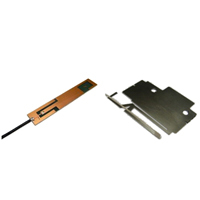 Advantech’s antenna team has decades of experience in the design and fine tuning of RF signal performance, and in reducing interference for multiple RF bands. 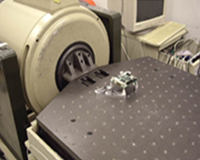 Also, Advantech has its own antenna engraving and production equipment for convenient prototyping and antenna performance verification in the product development stage. Advantech Mobile Computing provides seamless communications, with capability for RF module integration, including Bluetooth, Wi-Fi, 3G/LTE, RFID, NFC, and so on. Integration service covers quality and performance tuning, complying with regional/ national regulations and meeting carrier certification requirements. Advantech is one of the worldwide Intel® ECA premier members. ECA premier members enjoy Intel’s dedicated support and early access to platforms for embedded computing and communications, which gives Advantech access to the latest technology and applications. Advantech has been named by Microsoft® as an Embedded Gold Partner in Taiwan, Korea, and China. This partnership authorizes Advantech to provide Microsoft® Windows® Embedded software products either alone, or together with our embedded hardware solutions. Advantech develops RISC-based Industrial Tablet PCs based on the ARM processor and Cortex technologies (Freescale/ TI/ nVidia). Together with RISC Design Support Services, we provide a streamlined design process and help customers rapidly bring their concepts to realization. Open Source OS (Linux & Android) on both x86 & RISC platforms are also in the Advantech Mobile Computing portfolio, and fulfill customer demands for different vertical applications. 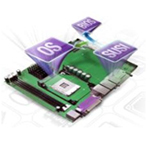 Advantech Mobile Computing focuses on Kernel Driver/bootloader and framework integration. 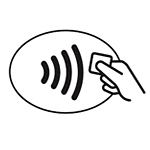 We also build in SUSI Access for vertical applications based on Linux QT framework. We support Linux BSP so customers can develop software for specific applications. 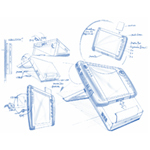 Advantech Mobile Computing product design concepts are based on technical feasibility projections: ID designs that consider market attribute mapping, the human factor, ergonomics and user scenarios. 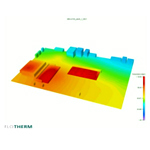 We develop technical designs based on thermal simulation results and careful consideration of component characteristics. 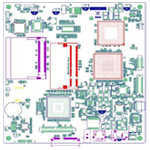 Advantech Mobile Computing has a dedicated PCB simulation team that does board simulations for Power Integrity/Signal Integrity and pre-sim/post-sim. The antenna team evaluates suitable antenna types for mobile computing devices, and leads antenna prototype sample creation. 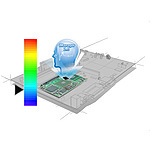 Board level EMI/ESD simulation is implemented in the early stages of product development. Advantech Mobile Computing provides specific applications for different vertical markets. Peripheral and software integration and applications are developed according to customer requirements and for diverse user scenarios. Advantech Mobile Computing’s system integration includes 3D ME drawing design, rendering/mockup making, board thermal simulation, airflow simulation and system thermal simulation. 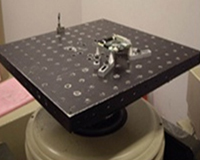 Each product’s system integration must be validated by R&D and QA. 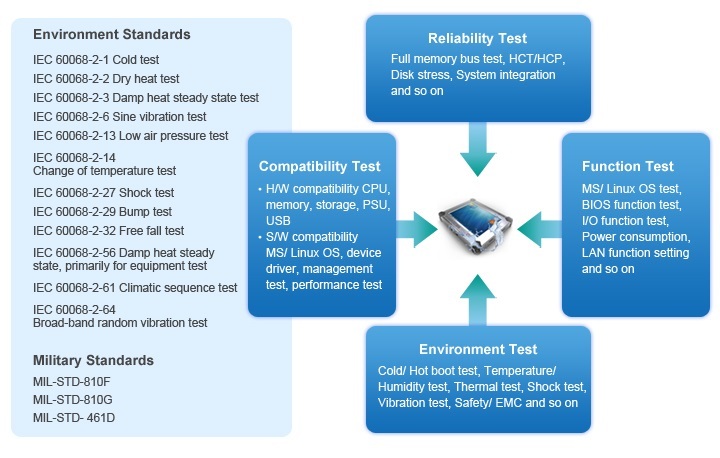 Advantech Mobile Computing’s industrial grade validation must pass reliability tests, compatibility tests, functional tests and environmental tests. 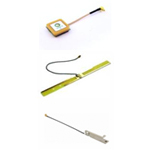 Different product features are tested carefully, corresponding to various environmental and military standard test criteria.